The only crops around Kodiak were salmon, halibut, herring, blue foxes and moonshine. Some clams but not in commercial amounts. Crab or shrimp hadn't even been heard of, at least I never heard them mentioned. Not too much moonshine as the incoming boats from the States generally picked up good liquor at some Canadian ports. One skipper was caught and he decided it would be easier to exit this vale of tears via a .38 caliber. The revenuers would come to Kodiak once in a while but as soon as it was known they were on the ship, a small motor boat would leave the harbor on its errand of mercy to tip off the moonshiners. This boat was about the only one around to take the revenuers on their search so they had to wait for its return before they could leave. There had been some blue fox farms in the area but the bottom had dropped out of the fox market so many of the fox farmers had to resort to turning out white mash to keep the home fires burning, always hoping for a return of the market for the fox fur. Before we arrived in Kodiak the town was in the throes of a big boom due to well-founded rumors that a cold storage plant would be built there in the near future. Everyone was highly elated as this could very easily make Kodiak into a second Ketchikan. It would save the halibut fishermen a long haul to Ketchikan. After looking the situation over we were quite dismayed to find that the only medical man in town was a young USPES "first aid man" whose primary duty was to give first aid to sick or injured seafarers. He also took care of all the sick, lame and lazy in town. He was a very fine fellow and was always trying but all he could do when an ailing person called him was to ask the patient what seemed to be wrong. Then be would thumb through his little black book and try to find something that would dovetail with the patient's description of his ailment. If a patient was seriously ill we would contact any passing ship and appeal to them to come in and take the patient to Seward. It was a very healthy climate so this didn't happen often. A few days after we arrived on Woody Island, the Lieutenant and Mitchell went on their hunt using a Bureau of Fisheries boat. When they returned a week or so later, the Lieut. was in a bad mood over something that had happened on the hunt. He insisted on going to a hotel in town. Mitchell tried to tell him the hotel wasn't much of a place but he insisted, so we took him over to town. We had no sooner returned to the station when he called and told us to bring him back. The Lieut. thought Mrs. Mitchell's bread was the best ever so she gave him a pint jar of her yeast starter which he put in his suitcase. His ship was due to sail at 9pm. It was dark when we started for town. The Lieut. had an enormous duffel bag which we put on top of the launch cabin. Out in midstream a tide rip caught us and the bag went over the side. I swung the tiller hard around. Luckily the bag was tightly packed. When it came to the surface we were right alongside it. We helped the Lieut. into his stateroom with the luggage. I inadvertently placed the suitcase right alongside the radiator. I didn't know the yeast starter was in the suitcase. It 'a not hard to imagine what happened when that pint jar, sealed tight, became a trifle too warm. Nothing like giving the visiting brass a good send-off! One day in town I was talking with Erskine's office man, Mr. Knobel. I said: "Mr. Knobel, you were here when the radio station was first built. Why in the name of common sense did they put it on Woody Island when there is so much open land right here adjacent to town?" He laughed and said: "I wasn't here but I know the story. It all happened over about $2 worth of cheap hard candy. Mr. Erskine will confirm this story. It was about 1910 or 1911. A Navy supply ship came in here and unloaded many tons of material and equipment to build the radio station, then the ship went westward with material for more stations. The Navy Yard workmen kept their tools and work clothes in the warehouse. One day while they changing clothes, one of the men saw this 20 pound bucket of candy and broke it open. Later the warehouseman discovered the open bucket and reported it Erskine's partner, who was a very hot-headed fellow. He declared himself to the men and demanded they pay for the candy. The workman laughed at him and told him to go jump off the dock. When the Navy supply ship returned the partner demanded of the skipper that the men be made to pay for the candy. The skipper saw how ridiculous the whole affair was. He sided with the men. He told the workmen if that was the way the partner felt about it, they could look around and put the radio station anywhere they pleased just so it was in a good spot. The workman, to spite the partner, chose Woody Island. And that is how the radio station was located on Woody Island." The next time I saw Erskine I asked him about it. He confirmed the story and said: "If I had been here it certainly wouldn't have happened but unfortunately I was away in the States and my partner was a hard man to get along with." I had heard the story of how the two radio stations at Cordova had been located. It sounded like it was a figment of someone's overactive imagination. After hearing the story of Woody Island, I thought the Cordova story might not be too far-fetched. 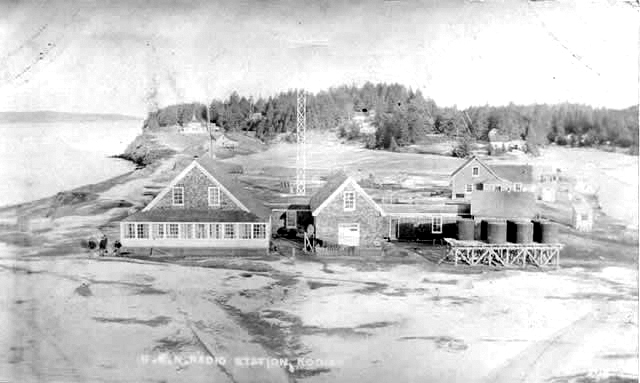 About 1915 or thereabouts the Navy decided to establish headquarters for the Alaskan Division of the Naval Communication Service at Cordova. Two stations were to be built, a transmitter station and a receiver station. The Navy Yard at Mare Island sent a crew of construction men and radio engineers to Cordova to locate the most suitable sites. The Whiteshed location at that time was unsuitable because it was accessible only by boat. The crew had been instructed to concentrate on locating the stations along the Copper River railroad. They rented a speeder from the railroad and cruised up and down the track for quite a few days. They couldn't agree on the best locations. One evening at dinner the boom man said: "I just received a message from the Navy. They told us to quit stalling and locate these stations so construction could begin before winter sets in. Tomorrow morning I'm going to bring two bring two quarts of whiskey to the speeder. When we leave town we will start working on the first quart. Where we finish that quart will be the location of the first station. Where we finish the second quart will be the location of the second station." The first station was located at Mile 7 (Eyak) where the receiver and control station was constructed. The transmitter station was located at Mile 14 (Hanscom), named after George E. Hanscom, Senior Radio Engineer at Mare Island, who supervised the construction of all of the early Navy radio stations on the Pacific Coast and in Alaska. While the population of Woody Island was, as Bart noted, "skimpy," the orphanage was home to about 75 children. 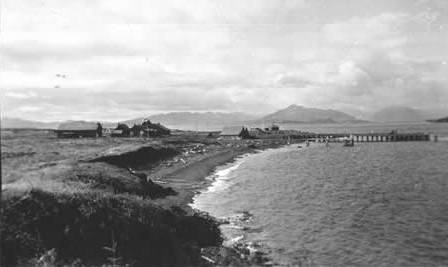 Woody Island and other islands in the Kodiak archipelago had historically been home to thousands of native Tangirnarmiut. When Russian fur traders arrived in the 18th and 19th century, they brought with them white man's diseases. An estimated two-thirds of the native population was wiped out. Woody Island was designated by the Russians as a gathering place for the survivors. Ernest and Ida Roscoe founded a Baptist orphanage and church on Woody Island in 1893. This provided a home for some children who needed one. But it also led to many conflicts with Native families over the custody of their children. The Baptist missionaries sometimes brought children to the orphanage, even against their parents’ will. They also discouraged the practice of Russian Orthodoxy, which was the faith of most Woody Islanders at that time. In 1910, the orphanage was part of a mission located on 640 acres. It included a large garden, dormitories, a main building with kitchen and dining rooms, a hospital and dispensary, lighting plant, barn, cannery, silo, carpenter’s shop, and superintendent’s office and living quarters. The orphanage was destroyed by a fire in 1925. rebuilt, and burned again in 1937 when it was relocated to Kodiak. 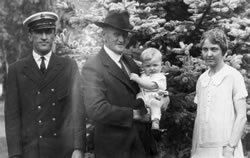 Bart "Skinny" Phelps, grandpa Thadeus Phelps, Hal, and Betty Phelps in Bremerton Washington, August 1926, shortly after leaving Woody Island, Alaska. Larger image. 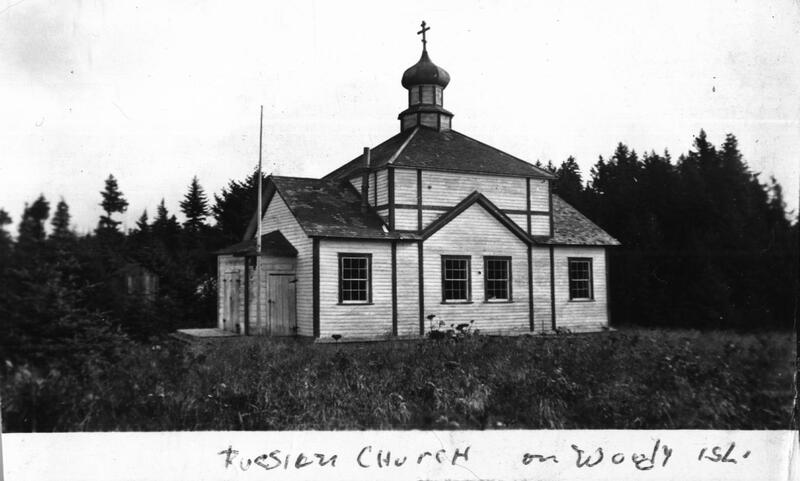 Russian Orthodox Church, Woody Island, circa 1941. Photo by Elmer Aemmer. Courtesy of Kodiak Military History. The station at Seward was way out on the mud flats where almost every high tide the men had to go out in a boat and rescue the oil drums that had floated away. Harry Martin, an old time radioman, had opened up the Seward station in 1918. He sent me a picture showing all the buildings surrounded by water, which he labeled, "after a light rain." I found out later it was during a flood tide. Now I was ready to believe anything about the locating of Navy Radio stations in Alaska. I had decided that the Navy wouldn't try to get rid of the Kodiak station. It was doubtful that the Army would want it and there was not enough revenue from the few messages we handled to make it pay for a private owner but I knew that I wasn't going to paint this place up like I had at Ketchikan. So help me, in the spring of '25 we received a message: "Take a complete inventory of the government property on the station and prepare the station for sale." We went along as usual and nothing came of it. In the winter of 1924-25, the temperature dropped rapidly. It was down to about 11 degrees when Mitchell said: "We had better get the furnace started right now." We started for the boiler house when Mitchell said, "My God, we'll have to put in a new damper. I ordered one and hung it in the boiler room but forgot to put it in." The old damper was so badly rusted we had to chisel out the bolts, which took some time. I was waiting in the boiler room for Mitchell to bring some tools when something zinged across the room and hit the other side like a shot. It took me some time to find that a plug had popped out and the pipe was frozen solid. We had waited a trifle too long. We got the damper in and started the furnace, hoping there was no damage to the boiler. There wasn't, but when the water warmed up we found there was no heat in about half the radiators. That was about noon and at four the next morning we thawed out the last pipe. The pipes were all heavily lagged. Crawling around under the houses in cramped quarters to remove the lagging and put a blow torch to the pipes was a job I hoped never to do again. I vowed that the next year would start the furnace on the Fourth of July. At least freezing weather would never sneak up on me again. I was still learning the hard way. One night in the winter of 1924-25 we were browsing through the wish books for luck or other forms of entertainment when we heard someone yelling outside. I stuck my head out the back door and heard the dreaded cry of FIRE, from the direction of the mission. We got into warm clothes in short order, picked up all of the two gallon fire extinguishers and slipped and slid to the orphanage with the 40 gallon soda acid fire extinguisher cart. The fire was confined to an upper room at the time. We climbed on the porch roof, broke open a window and turned on the nozzle of the tank. Not one drop came out of the tank because someone had at sometime before tipped over the cart a trifle too far when cleaning under it, a little of the acid had spilled into the soda end started the mixture working. There wasn't the slightest leak in the tank lid or hose to warn us that it had become deactivated. There was nothing at the mission to fight the fire so all we could do was stand by and watch it burn right to the ground. We rescued most of their supplies from the lower floor but it took a few good swats on the posterior region of the boys and girls to keep them on the job of getting the supplies out of the melting snow and into a shed. I put men on watch through the night to keep supplies from ending up elsewhere. The next day we repaired the shed and put a lock on it. Someone in town donated a large range. We hauled it over and set it up in the church. People in town donated many things to help the situation and we finally got things in condition to feed everyone. They slept anywhere they could find room to put a cot, if they had a cot. We had another experience with fire on the station in early 1925 when everyone on the station was in town except Mitchell, his wife and Betty [my wife]. Mitchell started for the boiler house to check it when he saw the roof burning. He ran and told the two women to bring buckets of water. He picked up a couple of small extinguishers and the fire was quickly dead. This could have been disastrous as our gasoline tanks were within six feet of the boiler rouse. This reminded me of the story Harry Martin had told me. He was at Kodiak in 1912 when Katmai exploded and the whole area was covered with a pall of ash so thick it was almost impossible to see anything. Every person from the station was in town except the man on watch. When they decided to return to Woody Island they realized they were stymied. The ash was too thick so they made no effort to return. What they didn't know was that a jolt of lighting or a heavy charge of static electricity had hit the antenna causing a fire which destroyed most of the station, their living quarters included. None of the men had a bank account in the States. The dresser drawer was their bank. Nothing could be safer. Martin said he lost over $900 and that was pretty close to a year's pay. He got it back after many months of waiting for the Navy to confirm the loss. After Mt. Katmai blew up the only animals left were the bears. While I was there they had started restocking ptarmigan, rabbits, etc. It was in 1926 when they brought in the first deer. I was talking to Mr. Pavlof one day. He said; "Do you see those rocks out there? They were brought here as ballast in the old sailing ships that used to carry ice from here to San Francisco for several decades after 1850." That was hard to believe until I realized that San Francisco was a long ox cart haul from the nearest ice in California. Mr. Pavlof was a very fine old gentleman, in as eighties in 1925. He had been educated in Moscow and St. Petersburg. His father or grandfather was the last Governor of Alaska under the Russians. One time we started for town and around Forget-Me-Not Island the fog settled down fast. I slowed down and put a man in the bow with a boat book. He let out a yell right away and we found ourselves in a mess of rocks but we got out without scraping anything. Before we started back to Woody Island, I phoned the station to send a man down to the dock to start pounding on the crane to guide us in. I wasn't worried about missing Woody Island but I wanted to get somewhere near the dock. I watched the boat's wake, to keep on a somewhat straight course and ended up about 100 yards north of the dock. No compass on the boat — it was in the storeroom, of course where such things belonged! On the trip back to Woody I again thought of the crew not being able to get back to the station in 1912 and I was thankful the fog caught us as it made me realize what a predicament I would be in if such a thing happened just about the time the baby decided to enter than world and I had to get to town for the doctor or nurse. The next day was clear so I got the compass out of the storeroom and headed for town to lay out a compass course. I did the same thing on the return trip. This would be strictly by guess and by God in a fog as I couldn't take into consideration the wind and tide but it would give me a chance anyway. On June 1, 1925, Betty was feeling full of pep so she turned out the wash. We know the time was getting short but she felt too good to take it easy. Around 11 PM Betty decided that I had better get the doctor. I called the doctor and Mr. Clarke, so when we arrived, they were sitting on the dock. It was a beautiful night but, on the return to Woody, I was getting nervous and cut it a little too short passing Goat Island. The boat slowed dawn and I knew I was in the kelp bed. I threw out the clutch and raced the engine then threw the clutch in reverse hoping to cut free of the kelp. I rocked the boat back and forth several tines, hoping that the old clutch would hold up. I finally broke free and clear. I sure cussed myself for making plans to cope with the fog and then to find myself enmeshed in kelp. About 4 AM the baby was born, a perfectly normal boy and that's all we wanted. It had been very nice duty at Kodiak. We rather hated to leave when my tour of duty came to an end. We had been very fortunate in every way, very little trouble with the baby and what the doctor couldn't come up with as a cure for his ailments, Mrs. Clarke never failed us. 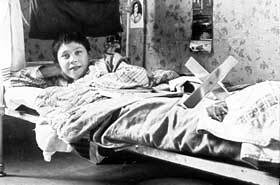 When I received my order, I went to Erskine's and reserved a room with a bath on the SS Watts. Junior was a year old and it would be much easier with a private bath. Several days before we were due to depart I asked Mr. Knobel in Erskines if he was positive I had the bath reserved. He assured me that we had it. I must have had a hunch on it as, when May 24, 1926 came and we went aboard ship, we found the door from our room to the bath was locked. I located the Purser and told him that the door to the bath was locked. He told me we didn't have a bath reserved. I told him that I had checked with Mr. Knobel in Erskines a few days before and Mr. Knobel bad assured me that we had the bath reserved. The Purser said, "I'm sorry, but it's too late now, there is nothing I can do about it." I told him that I was going to get that bath one way or another and then he asked me if we would share it with the lady on the other side. I told him positively not as we had a year old baby and we needed the bath more than the lady did. The Purser still refused to do anything about it so I told him I would see the Skipper about it. He just shrugged. I thought about it a minute and then said; "Mister, you have my mad up. I'll be damned if I go to the Skipper. You took that bath away from us and I'm going to see that you give it back. Now I'm going to give you a much fairer deal than you gave me. I'm going back to my room. In exactly fifteen minutes, if that door isn't unlocked, there in a fire axe outside my room which will open it, even if I spend the trip to Seattle in the brig. Remember, fifteen minutes!" I returned to my room. In about ten minutes the bath was ours. Such things have always happened. It was back to sea duty for me. Maybe I would get back to Alaska another time. I was quite sure that one tour up there wouldn't be enough for me. On February 28, 1931, the wireless station was decommissioned and shortly thereafter the Territory of Alaska was given permission to use the associated buildings for the Longwood School. Bart Phelps also wrote about his adventures and misadventures as a radioman on Wailupe, Hawaii. For a detailed history of Navy Communications in the Pacific, see Nick England's excellent site, Navy Radio.